We are happy to announce that All Americans Dave Shaeffer and Stephanie Sandler will be holding a two-day trapshooting clinic at the Rockingham County Gun Club. Mark your calendars for April 17th and 18th and please pay attention to the following information. Go to Dave’s website at http://www.daveshaeffershooting.com and download the shooters packet if you are interested in attending. Dave’s website will explain just about everything you need to know about the clinic. The clinic will be held at the Rockingham County Gun Club near Reidsville North Carolina. We currently have PAT Traps and ERAD wireless voice release systems. We will confirm the daily start times as soon as they are confirmed. Dave Shaeffer is a proven winner with the following titles to his credit. 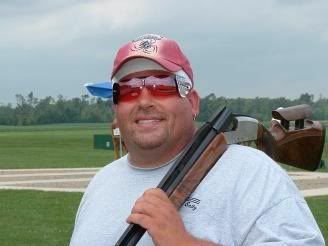 2009 Grand American Clay Target Champion with 200 and 525 broken in the shootoff. AAA Class Singles Champion 2009 Grand American. 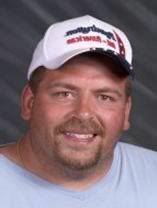 He is the winner of the 2009 Nitro 27 handicap with a 100 straight. Maryland State singles champion 2006-2009 and 2009 Autumn Grand handicap champion with a 99. He currently holds the world record for the longest run in singles at 2166. Now those were just a few of his accomplishments to his credit and there are many more. 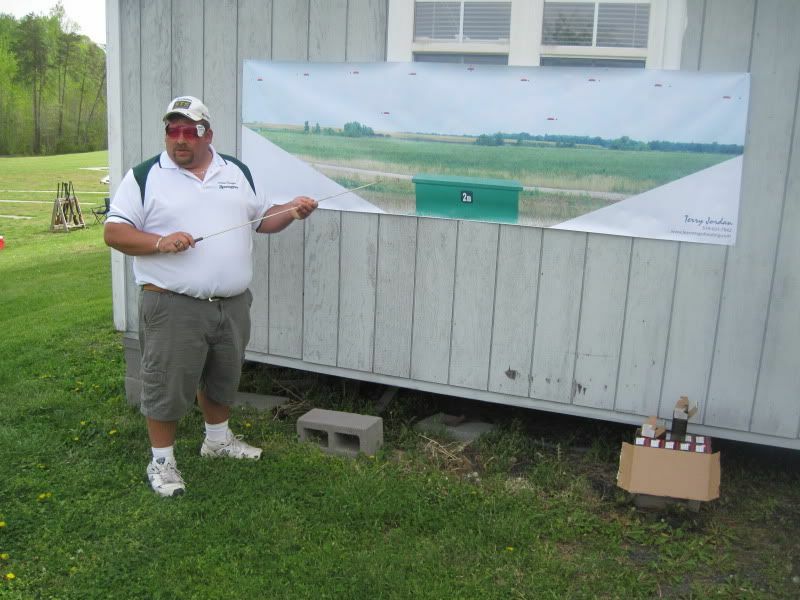 I believe that if you are interested in improving your competition shooting Dave Shaeffer can help you find those extra targets that lead to winning scores. Class cost is $300 for the two day event and target fees will be an additional cost that will be paid to the local club. Targets will be provided to the class at $2.50 per round for singles and handicap and $5 per round for doubles. If you are a little worried about the cost of the class just think about this. If you attend a local shoot and shoot the 300 target program and play all the options you spend about 100 dollars plus your shells. Even if you reload you have spent $150 bucks and might get back a few dollars if you win. If you are struggling with your shooting and need to get back on track this might be the clinic for you. Fred Redmon at freddydacrusher@hotmail.com or Tom Cox at 336-342-4568 or email at tjcox@aol.com. We will be more than happy to answer any questions that you may have. REMEMBER – there are only “10” spots available and at this time we know of four people that have expressed their desire to attend the clinic. 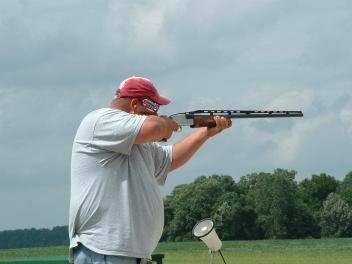 Dave Shaeffer at the Cardinal Gun Club in Ohio. If you are planning on attending the Shaeffer/Sandler clinic in April you better move fast. Go to Dave's website and download the shooter information package and get him a deposit no later than March 10th. This will get you locked in for the clinic and make sure that we fill all 10 spots. I just found out that two more shooters have expressed interest in the April clinic..
We would like to thank you for attending the Dave Shaeffer & Stephanie Sandler trapshooting clinic. This document is designed to answer some of the questions that you might have about the clinic. Please refer to Dave’s website for information about his teaching schedule. Start time: please be at the club on Saturday April 17th by 8:30. This will give you some time to get familiar with the club and get your gun and shooting accessories ready for the day. Training will start at 10AM with lunch around noon and Dave will determine if we need to work any later than 5PM. Sunday we would like you to be on the grounds around 8AM with training to begin at 9AM. Lunch will be around noon with training ending at approximately 3PM. Dave will be leaving to travel back to Maryland and we would like for him to get on the road at a decent time. Please remember to bring something to write in like a notebook and something to write with. If you are a note taker like me these notes can be invaluable long after the class is over. Also please be prepared for any weather conditions including bright Carolina blue sunshine or misty TarHeel raindrops. We will be shooting approximately 500 shells for the weekend so bring at least 2 flats of shells. It seems that most of the folks taking this class are short yard shooters so please pack your shells accordingly. Remember these rounds will need to be paid for and they are $2.50 per singles/handicap and $5.00 for a 50 bird doubles round. This is the charge that Rockingham club members pay for their rounds and a little cheaper than the $3.50 charge for non members. If you are interested in bringing your travel trailer we have electricity but no “facilities”. You can park near our bathroom/showers and plug into the power there. The club charges $10 per night for camping at the club. If you need more information please let me know if you need to get into the club on Friday night. Lunch is not provided at the clinic and we need to see what everybody would like to eat. Some folks may bring their own but on Saturday we can place an order at the Ruffin grill for great hamburgers and hot dogs. Sunday we might order a couple of pizza’s to ease those hunger pangs. We will provide some fresh Krispy Kreme doughnuts for those of you on a diet. Local lodging is not far away and we will list the four motels in the area. Not only am I helping organize the clinic I will also be taking the clinic. 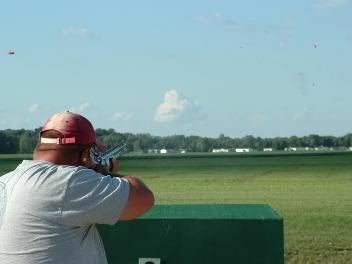 Our main goal is to provide an excellent environment for you to take an informative clinic from two ALL-AMERICAN trapshooters. I have done this before and if you have any issues at anytime I want you to let me know how to make it better. For directions to the club go to http://www.nctrap.com and look for the Rockingham Gun Club - Or go to http://www.rockinghamgunclub.com for club info. Day 1 is over and it was a beautiful day to host a clinic at the Rockingham Gun Club. Dave Shaeffer and Stephanie Sandler had 5 students today and they had their hands full. We took turns at the pattern board, took a look at foot position and hold positions. We shot drills which were very helpful with keeping the gun still when calling for a target. The wind was something and we managed to shoot 200 targets in the session today. Hopefully the wind will lay down a bit Sunday with handicap and doubles left to visit. All in all it was a great day and we are looking forward to the Sunday session..